Magic Mesh is a screen door that opens instantly when you walk through it and closes itself. The Magic Mesh are similar to Bug Off Instant Screen where it works by placing magnets in strategic positions to automatically close the screen. 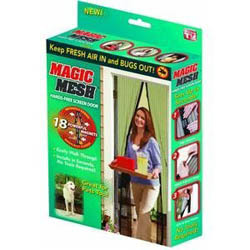 The Magic Mesh are great for hands free entry and exit for both people and pets. Another great feature is that they will keep the bugs out but still allowing air to flow through the house. With your help we can reach more people and let them know about Magic Mesh whether this product works or not. I live in an apartment and I'm not allowed to put up a screen door so I bought this to let fresh air in. Set up was easy. That is the only nice thing I have to say. It looks ugly on my door. I have a metal front door and any time someone would walk in from outside the magnets would stick to the door instead of going back together. Wind makes it open. After 3 days of people going in and out it started to tare away from the boarder. This is only good if it is used for one day like having a bar b q with friends that will be going in and out of your home. bought it online 07/12/2011, and recieved it 08/05/2011. you will need to have a patience of a saint to wait this long especially if the shipping is as expensive as the mesh itself. the verdict after a couple of days of using it on my back door, it works good as long as there's no breeze, the magnet is not strong enough to hold together the mesh if there's a breeze. all in all, this is a OK product.